Ray Grehan - Ready Steady Gone! Ray Grehan played a very important part in the development of the north east music scene in the sixties and early seventies. His roles as a club owner, manager and agent have to some extent been overshadowed by the exploits of his contemporary Mike Jeffery who found fame as the manager of Jimi Hendrix. Nevertheless Ray’s story, which involves run-ins with the law and scrapes with some of the country’s most notorious criminals is well worth telling. I first met Ray Grehan in the spring of 1965 not long after joining my first Newcastle band, the Kylastrons. The leader of the Kylastrons was the talented, well-respected guitarist – Malcolm ‘Mac’ Langstaff. Mac had been involved with Ray Grehan for a number of years. Through Ray’s connections as an agent and club owner Mac secured gigs for the Kylastrons all over the northeast, Yorkshire and Cumberland. Mac talked a lot about Ray Grehan and a group that he managed called ‘Kim & The Kinetics’. At the time Kim Davis was a rising star on the Newcastle music scene and Ray Grehan wanted to take her to the top. One night at a Kylastrons’ gig at the Blue Note in Sunderland, Mac formally introduced me to Ray Grehan, who owned the club. At that time and for many years after, I thought that his surname was Graham – not Grehan. I have to say that my first encounter with him left me in awe. He was immaculately dressed in a business suit and within the rather seedy environment of the Blue Note, he exuded an air of authority. To be honest, in spite of his superficial pleasant manner, I found Ray to be a rather intimidating. He seemed like a cross between a successful businessman and dodgy used car salesman and I didn’t really engage with him. I was surprised, therefore, that the next time I saw him at the Blue Note, he offered me a job as a sax player with Kim & The Kinetics. Without much thought, I turned the offer down. I was a young, relatively inexperienced musician at that time and venturing beyond the Kylastrons into the world of Ray Grehan would have taken me way out of my comfort zone. In 1965 I had no idea of the part that Ray Grehan played in the management of the Club A’Gogo and other Newcastle clubs some four or five years earlier. Until fairly recently I wasn’t aware of the dealings he had in the sixties with some notorious gangsters such as the Kray twins. 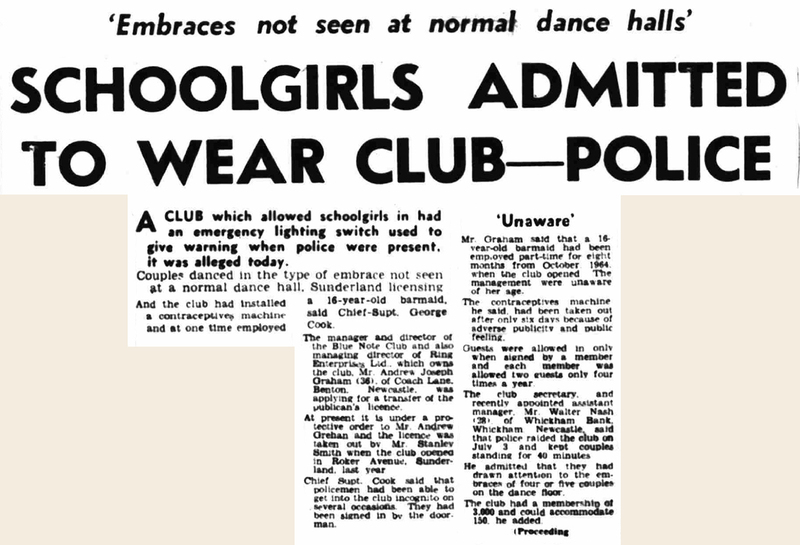 Anyone with an interest in Newcastle’s iconic sixties club – the Club A’Gogo will probably know that it was opened in 1962 by a gentlemen named Mike Jeffery. Mike Jeffery was the person who launched the career of The Animals when the band were regularly performing at his club. In 1963 Jeffery became The Animals’ manager and engineered their meteoric rise to international stardom. Three years later, along with The Animals bassist, Chas Chandler, Mike Jeffery struck lucky a second time and became the co-manager of American guitarist Jimi Hendrix, the highest grossing rock star of the sixties. The chain of events leading from the Club A’Gogo to Jimi Hendrix may never have happened had it not been for Ray Grehan. Without Grehan the Club A’Gogo would probably not have opened. It follows that The Animals may not have become a successful international band and that Chas Chandler would not have discovered Jimi Hendrix in New York. Perhaps Hendrix may have just remained a talented sideman or session musician in the United States completely unknown to the rest of the world. So what was Ray Grehan’s part in the Mike Jeffery/Jimi Hendrix story? Mike Jeffery had a flair for the music business. As a musician himself he had a good knowledge of music, in particular jazz. He also had great insight into the type of music that would draw crowds into the establishments he owned in Newcastle in the late fifties and early sixties. What Mike Jeffery lacked was the ability to financially sustain his various ventures on a long-term basis. On the other hand Ray Grehan had the business acumen to make a success of any project that Mike Jeffery could dream up. Ray Grehan’s story is a typical roller coaster ride involving many changes of fortune. And unfortunately the tale ends nearer the bottom end of the money scale than the top. Andrew Joseph Raymond Grehan (otherwise known as Ray) was born in Newcastle in the summer of 1928. His parents, Andrew Grehan, a school caretaker and his wife Sarah lived at Prospect Place in the Fenham area of Newcastle where Ray spent his childhood and teenage years. In 1953 he married Irene Gibson and the couple moved into rented accommodation on the Scotswood Road. At the time of the marriage he was working as a typewriter salesman. A few years later he gained employment with a ticket machine company called ‘Automaticket’, eventually becoming their sales manager. 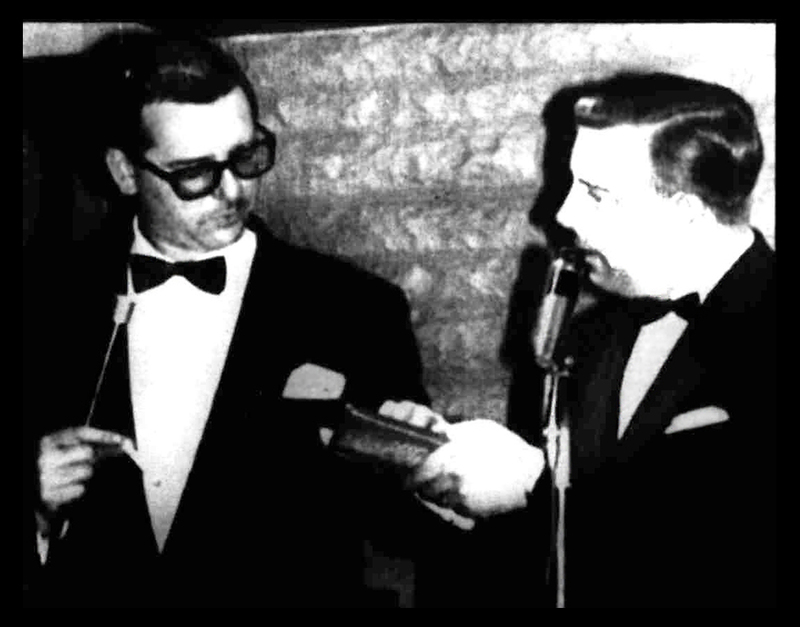 It was during the period that Ray Grehan was selling ticket machines that he met Mike Jeffery. At the time Jeffery was running two Newcastle establishments – the unlicensed Marimba Coffee House and the Downbeat club. Although both were quite popular venues, financially neither was doing that well. When Mike Jeffery first opened the Marimba and the Downbeat he had various partners and investors. By the time he met Ray Grehan most of these had fallen by the wayside. Mike Jeffery and Ray Grehan decided to form a partnership and resolved to eventually make some serious money. They formed a limited company called Expresso Maze Limited, primarily to help keep the Marimba Coffee House afloat. Not long after Ray Grehan became Mike Jeffery’s partner, they opened a third club in May 1961– the el Toro which was situated on the upper floors of the building that housed the Marimba. Unlike the Marimba, the el Toro had an alcohol license. Jeffery and Grehan also had grand plans for a fourth venue in the city and had gone ahead and acquired a suitable property on Percy Street, Newcastle above the Handyside Arcade. Their vision was of a licensed club with meals and gaming but above all providing good music to their target audience of teens and twenties. The premises they purchased had previously been the home of the Newcastle Labour Club. It required a lot of work and money to bring it up to the standard that the Mike Jeffery and Ray Grehan had in mind for their new club. They set up another limited company called Jazz Stands Ltd for their project and put their plans on hold until they could secure the funding to bring their dreams to reality. They didn’t have to wait too long for some money to come in. In November 1961 a fire destroyed the Marimba Coffee House and the el Toro. The subsequent insurance payout allowed work to go ahead on the premises in Percy Street. 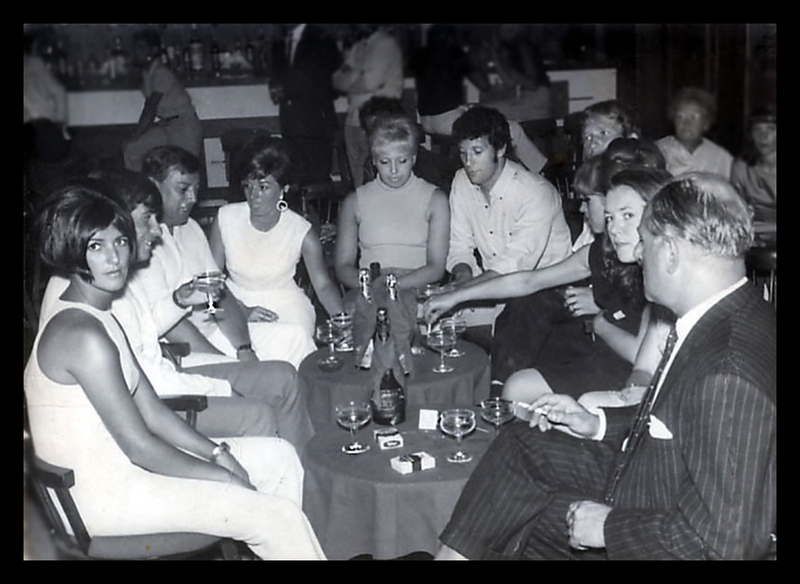 The Club A’Gogo opened its doors to the public on 6th July 1962 and over the next five years it developed from a jazz/Latin American venue into the number one club in Newcastle for live beat music and dancing. However, Ray Grehan’s association with the Club A’Gogo only lasted for a couple of years during which time he was convicted for the illegal operation of a roulette system called Legalite at the club. In 1964 Ray Grehan and Mike Jeffery parted company after Grehan found out that Jeffery was syphoning money from the gaming side of the Club A’Gogo into his own pocket. In 1964 Ray Grehan set up his own company named Ring Enterprises Ltd and acquired a couple of clubs in the northeast – the Blue Note in Sunderland and the Scene in Middlesbrough. His offices were based at Windsor Crescent, Newcastle. He was also managing the talented female vocalist he had discovered, Kim Davis whose career was beginning to take off. His empire was expanding in other ways, too. He bought into a Yorkshire based entertainment agency – the Chris Wainwright Agency. 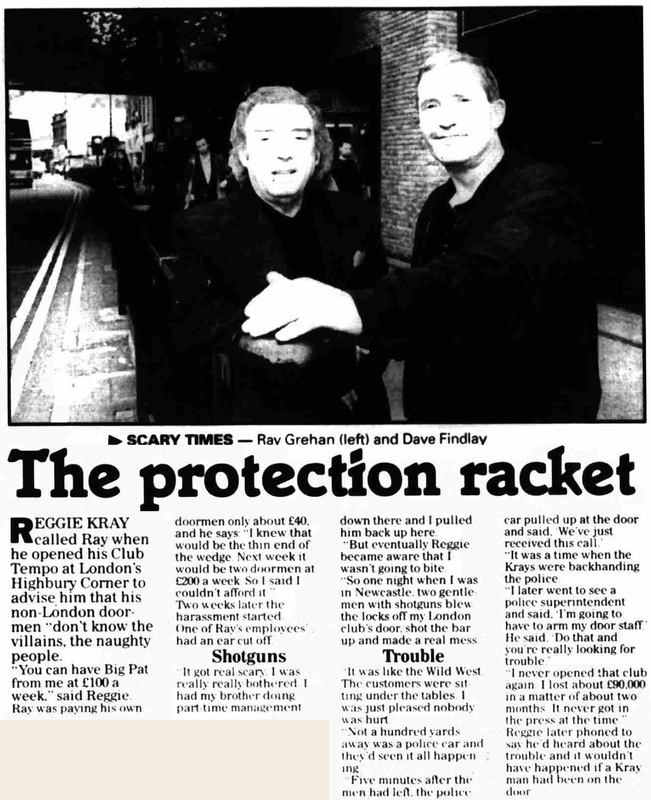 Ray Grehan’s involvement with the Legalite roulette operation at the Club A’Gogo steered him into installing Legalite tables at a Middlesbrough Bingo Hall. When the Mecca Organisation took over the bingo hall, Ray Grehan retained the gaming rights at the hall. This arrangement led to him running the gaming franchise for Mecca’s establishments throughout the UK. 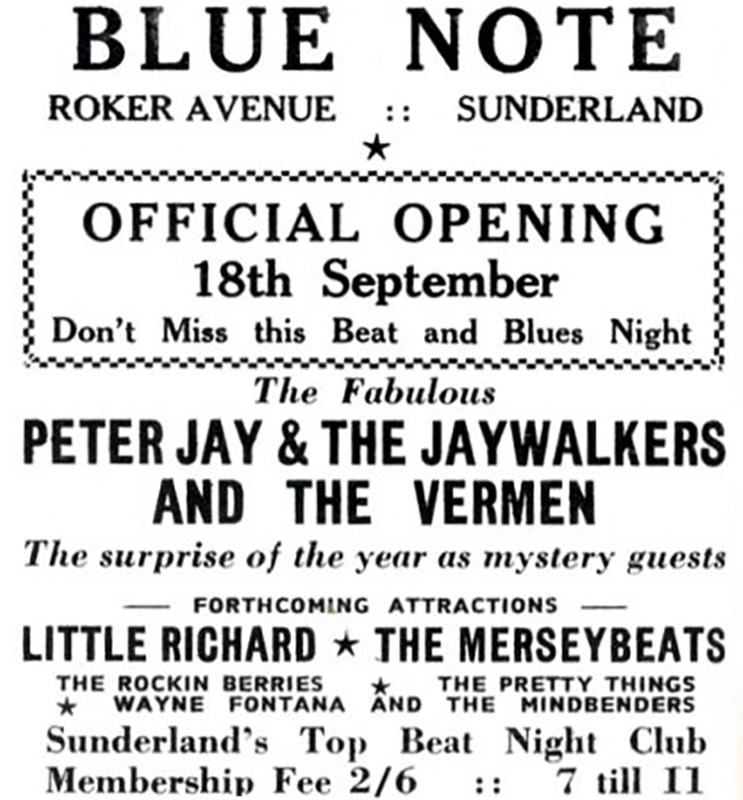 The Blue Note club in Sunderland should have been a great success. There wasn’t much competition in the town by way of other teenage beat clubs. Although the Blue Note had an alcohol license, its target audience was teenagers. In its first few months the club pulled in big crowds who’d come to see some of the top bands that Ray Grehan was booking. Unfortunately, Ray upset the authorities in Sunderland by installing a contraceptive machine in the gent’s toilet. Furthermore, over the house PA system, the club’s DJ was advertising the presence of the machine and advocating its use. The local press went to town in condemning Ray Grehan for encouraging immorality amongst the town’s teenagers. In spite of the bad publicity, Ray was able to wriggle out of the situation by immediately removing the contraceptive machine. However, the incident came back to bite him when he applied to have the club’s license renewed later in the year. The police objected to the renewal, citing the contraceptive machine matter plus the fact that Grehan had employed an under-aged barmaid at the club. The result was that the application to renew the club’s license was refused. This forced the closure of the Blue Note. In effect the club was only open for one year between autumn 1964 and autumn 1965. While money was pouring in through his various ventures, primarily the gaming arrangement with Mecca, Ray Grehan continued to live in his rented council house at Coach Lane, Benton, Newcastle with his wife and three sons. Although the house was a modest three bedroomed terraced property it became the scene of many late-night parties attended by Ray’s friends, including showbiz personalities who had been performing at clubs in the city. Ray Grehan became friendly with lots of entertainers and invited them back to his home – people like Tom Jones, Matt Munro and the Bachelors. The Rolls Royce parked outside his home must have given away the fact that this was no ordinary council house. Decades later Ray Grehan would tell reporters about a fourteen-bedroom mansion he owned in Forest Hall at the height of his career. The reality is that he did, in fact, buy a house on Northumberland Avenue, Forest Hall around 1970. But it was by no means a mansion – just a large semi-detached house. Ray had the property decorated and updated to a very high standard with a master suite accessed by a spiral staircase. He also had a wooden dance floor and a quadrophonic music system installed. The partying continued at the new Forest Hall address. In 1966 Ray Grehan opened the Pentland Club in Edinburgh, which became quite successful. 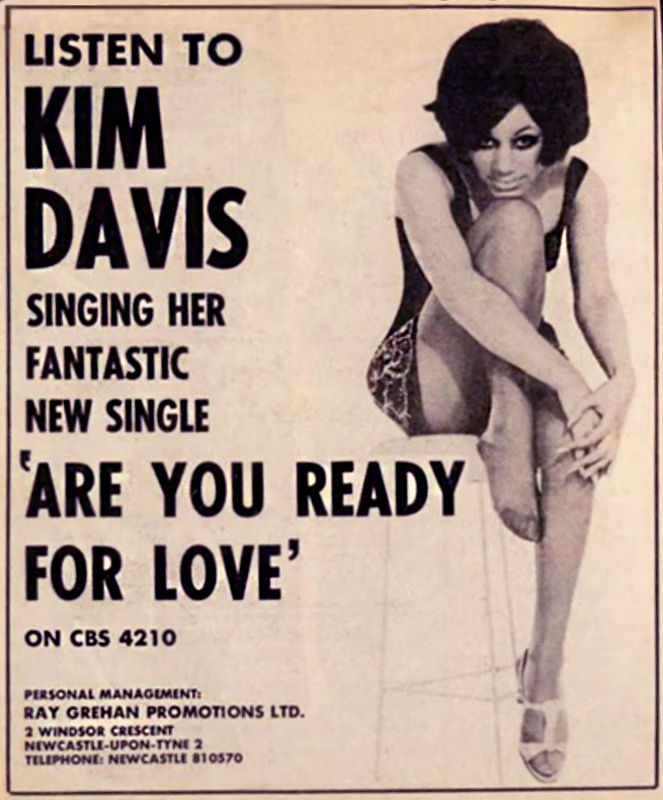 His protégé Kim Davis appeared there in the opening week along with her new band the Del 5. Ray Grehan booked national and international acts for the club including US rock & roll star, Little Richard. 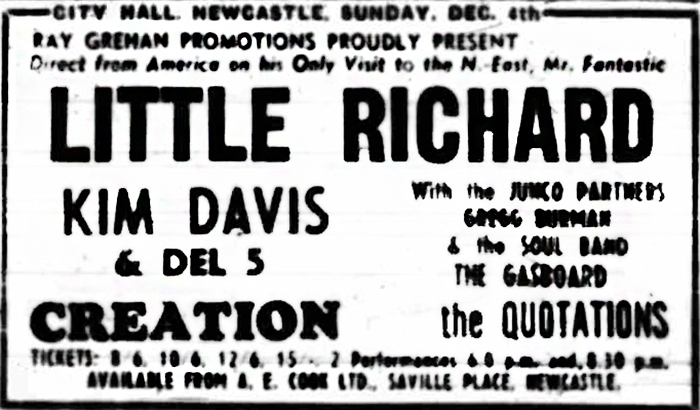 Little Richard appeared at the Pentland between 1st and 10th December 1966. On 4th December Ray took advantage of Little Richard’s residency at the Pentland and booked him to appear at a concert he was promoting at Newcastle City Hall. Ray Grehan’s lucrative gaming operation under the banner of the Mecca organization was beginning to attract the attention of some of the country’s criminal fraternity. Reggie Kray, the notorious London gangster made a trip to Newcastle in 1966 to visit Ray Grehan. He attempted to sweet talk Grehan into cutting him into his gaming empire. There have been many stories about how the Krays visited Newcastle and had been run out of town either by the police or local hoods. 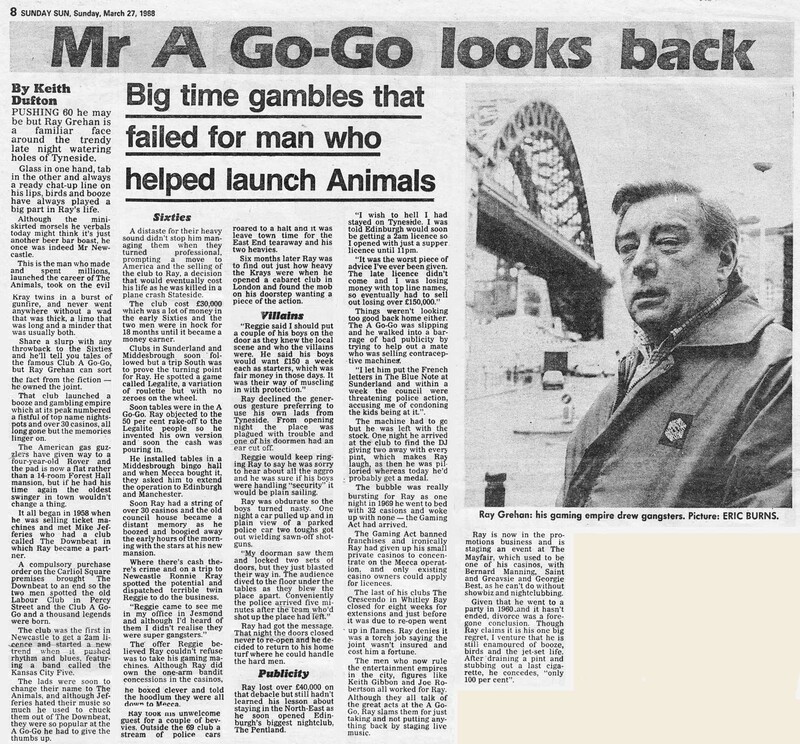 Ray Grehan’s version of events is that Reggie Kray and his two henchmen left Newcastle voluntarily after Ray convinced Reggie that he was only nominally involved in Mecca’s gaming and that Mecca virtually controlled the whole set up. Ray must have sweated for a few days wondering if his ploy had worked. After a while it became clear that the Krays had lost interest him for the time being and that what went on in Tyneside was not on their agenda. If Ray Grehan was spooked by Reggie Krays presence in the northeast in 1966 then what happened the following year must have been his worst nightmare. 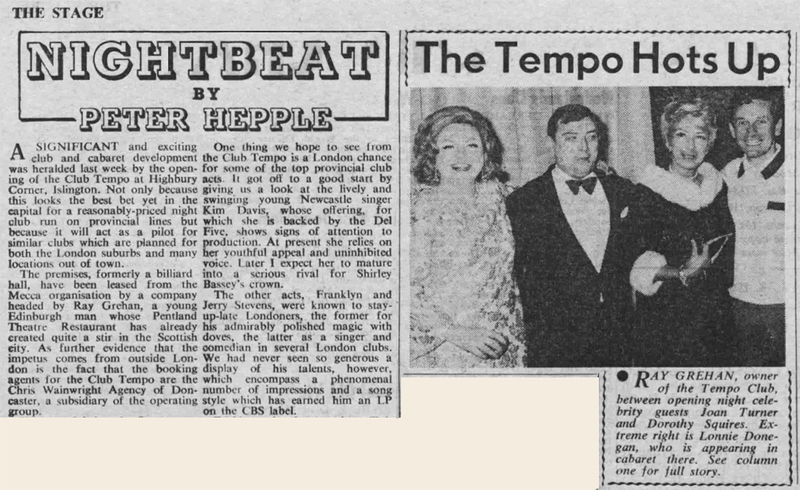 In May 1967 Ray Grehan opened a new 230-seat cabaret club called Club Tempo in Islington, North London. As with the Edinburgh club, Ray used Kim and the Del 5 as the opening act followed by a variety of international cabaret acts. The prices at the club were very competitive by London standards and the club received favourable reviews. Not long after Club Tempo opened Ray probably felt a bit uncomfortable about some of the undesirables in the audience. Allegedly there were several unsavoury incidents at the club including the night that gangster Jack ‘the hat’ McVitie (who was subsequently murdered by Reggie Kray) dropped his trousers and exposed himself in front of the stage where vocalist Dorothy Squires was performing. Ray Grehan had installed east ender ex-docker Freddie Fields as manager, perhaps hoping that his local knowledge might help in preventing this type of incident at the club. His plan went awry when some villains visited the club and demanded protection money. The visit ended with Fields being shot in the knee. Around 1967 Ray Grehan bought back into the Club A’Gogo. Mike Jeffery had long since lost interest in the Newcastle club and was concentrating on co-managing the Jimi Hendrix Experience with ex-Animal, Chas Chandler. He was also running several clubs in Mallorca. Because of his commitments regarding the Mecca franchise, Ray was hard-pushed to get involved in the day-to-day running of the Gogo and left the management of the club to others. By 1968 Ray Grehan was running the Carousel Club in Chester-le-Street and promoting gigs at the Mayfair Ballroom in Newcastle. He was still managing Kim Davis and her band, the Del 7, who were doing well as a cabaret act throughout the country. He also had plans to turn the Crescendo Club, a fairly quiet drinking club on the sea front at Whitley Bay, into a lively nightclub. But overall 1968 wasn’t a good year for Ray. The Club A’Gogo, which had been Newcastle’s number one club in the mid-sixties, was floundering and eventually closed down in June 1968 after a run of six years. In 1968 the British government was intent on eradicating criminal activity from the gambling industry and passed the 1968 Gaming Act, which, amongst other things, banned gaming franchises. When the act kicked in, Ray Grehan lost all the franchises he had built up with the Mecca organisation in the preceding four years. Ray Grehan opened the Crescendo Club in 1968. Kim Davis was one of the array of artists that appeared at the club in its first few months. The Club A’Gogo ex-bouncers, the Findlay brothers were hired by Ray to police the new venue. In actual fact Dave Findlay had worked on and off for Ray Grehan for many years – not just as a bouncer and a personal bodyguard but also as a painter and decorator at Ray’s various clubs, casinos and private residences. 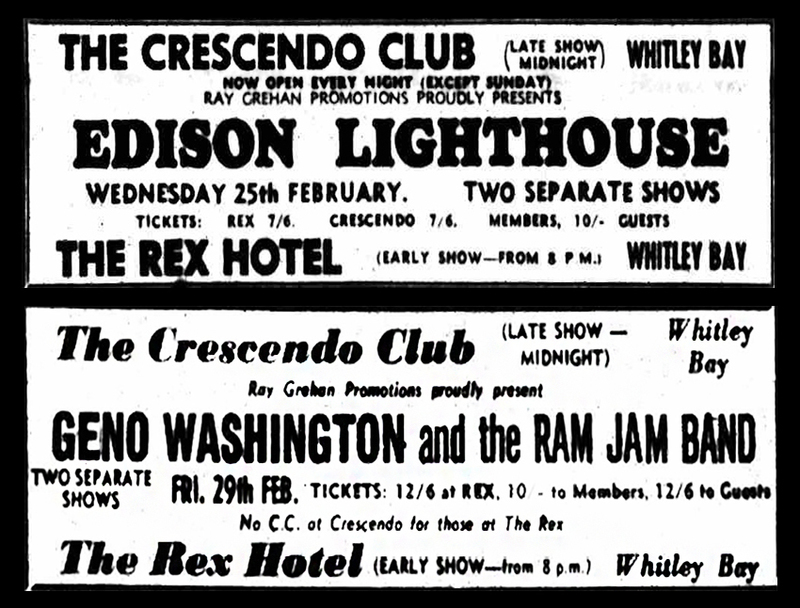 While he was the owner of the Crescendo, Ray started promoting gigs at the nearby Rex Hotel, Whitley Bay. Although the Rex was a licensed venue it drew in a much younger age group than the Crescendo. Perhaps hoping to emulate the success of the Club A’Gogo, which in its hey-day attracted mainly teenagers to its ‘Young Set’ and an older crowd to the ‘Jazz Lounge’, Ray used the Crescendo and Rex as dual venues. He booked some top named bands to appear on the same night at both places. However, in the same vein as the Club A’Gogo, the Crescendo Club started to hemorrhage money. 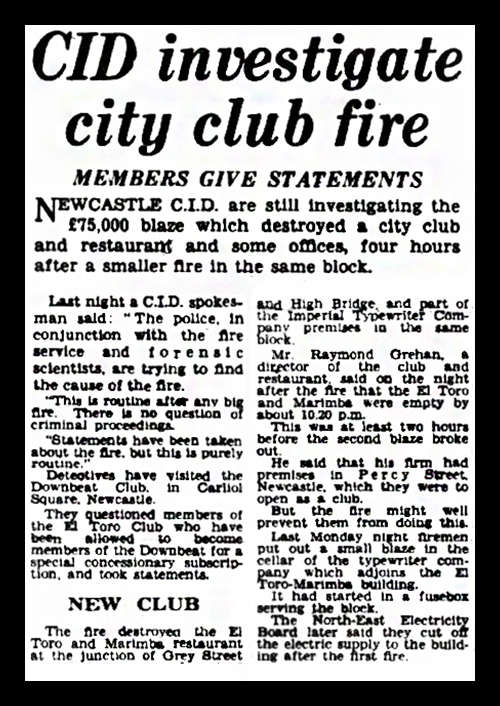 As with a couple of his earlier venues, the Marimba Coffee House and the el Toro Club, the Crescendo was destroyed by fire on 17th February 1971. After the demise of the Crescendo, details of Ray Grehan’s career are a bit sketchy. He couldn’t have been too well as one of his companies, Ray Grehan Promotions Ltd, went into liquidation in August 1972. Among his ventures in the seventies was the Delaval Arms, a large pub on Scotswood Road, Newcastle, which he hoped to turn into a music venue. He also had a number of bingo establishments and amusement arcades in Sheffield and Nottingham. Eventually Ray Grehan abandoned his life as an entertainment entrepreneur and found work as a furniture salesman at the Galleries Shopping Centre, Washington, County Durham. A few years later he ventured once more into the club scene. In the 1990s Ray and his son opened a bar and nightclub in Stanley, County Durham. The bar was called ‘Sams Bar’ and the nightclub – ‘The Buzz’. Although Ray Grehan’s contribution to the north east music scene is probably not that well known, the newspaper article below demonstrates how well he thought of by the region’s musical community. The legend of the Club A’Gogo, which Ray Grehan co-founded in 1962 will live on for a long, long time. The Gogo is still talked about fifty years after its closure. It is still remembered by many as being Newcastle’s best ever club. Ray’s protege, Kim Davis sadly died in 1980 of a brain haemorrhage. However, before her death she became a member of the successful European recording band – Eruption. Ray Grehan died, aged 67, in 1996. Acknowledgements: Thanks to Alan Rutherford (former employee of Ray Grehan) and Colin Woodland (ex-member of Kim Davis & the Del 5) for sharing their memories of Ray with me. 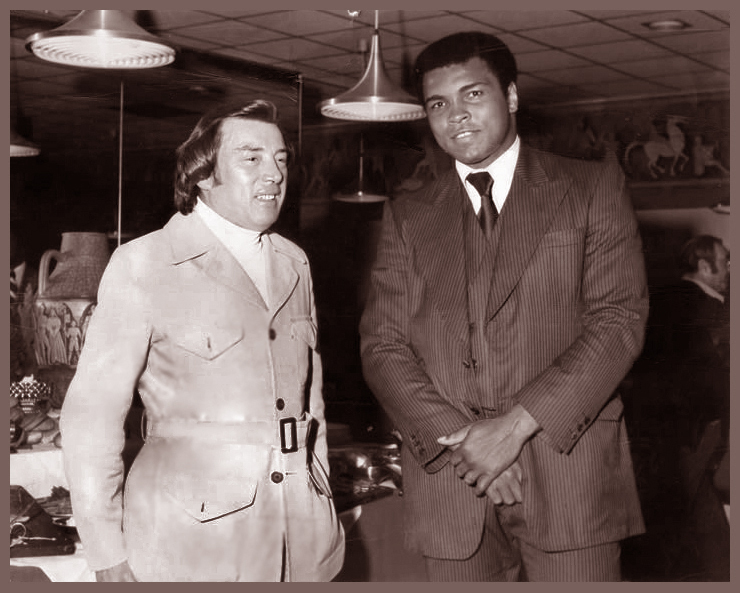 The 2 photos credited to Mike Grehan (Ray’s son) have appeared elsewhere on the web without copyright notices. I have assumed these to be in the Public Domain. Apologies if this is not the case. Another fabulous article and extremely well written. There is certainly a book in all of this, trying to get out ! Great research Roger, always a great read!